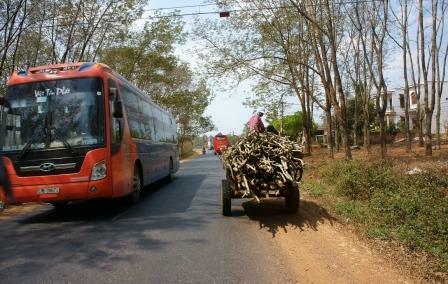 Vietnamese busses are quite the antitheses of busses in other parts of the world. They are equipped with TVs and karaoke machines! Many people rely on the bus in Vietnam and due to the ongoing upgrades you will see many more modern busses equipped with air-con and comfortable seating than in the past. Vietnamese busses are quite the antitheses of busses in other parts of the world. They are equipped with TVs and karaoke machines. This can make the ride incredibly loud and annoying or super fun and entertaining, depending on your mood. The bus is one of the cheapest modes of transportation in Vietnam and getting around will take a while, before you figure out the routes. You can get on and off the bus anywhere and tickets are so cheap (from a Western perspective) that it’s a great way to get lost in and explore the city. The bus ticket can be bought on board so it’s a relatively hassle free way to travel. If you are coming from the airport and don’t want to take a taxi, the best way into District 1 is to take public city Bus # 152 which usually stops on the right of the arrivals entrance. The bus runs every 20 minutes between 6am and 6pm. It takes you downtown to the Bus Station on the opposite side of the traffic circle from Ben Thanh market, at a cost of 5,000 VND + 5,000 VND if your luggage weighs 10kg or more. There are main bus stations where you can enquire about the schedule and get a bus map, or you can ask around. Once you get to grip with how things are run, schedules and routes, you will find taking the bus easier. There are many different bus companies and types of busses. Try to avoid the mini busses that cram as many passengers and their luggage in, these may be unsafe. If you want a comfortable journey opt for the express busses, there will usually be an available set. Remember to always keep an eye on your bags as petty theft is rife.